When Ted Cruz declined to endorse Donald Trump earlier this year at the Republican National Convention, one sticking point was the businessman's attacks on Cruz's family during the primaries. When Trump, now the GOP nominee, went after Cruz's dad and wife, Cruz said, he "abrogated" a GOP unity pledge all the candidates signed last year. TYLER — When Ted Cruz declined to endorse Donald Trump earlier this year at the Republican National Convention, one sticking point was the businessman's attacks on Cruz's family during the primaries. When Trump, now the GOP nominee, went after Cruz's dad and wife, Cruz said, he "abrogated" a GOP unity pledge all the candidates signed last year. But on Friday night, hours after finally endorsing Trump, Cruz said he is willing to put the personal acrimony behind him. "I have spent several months thinking about it, praying about the right course of action, and I’ve discussed the right course of action with both Heidi and my dad, both of whom I love with all my heart," Cruz told The Texas Tribune. "And all three of us have decided to forgive the past, and my focus in making this decision was on trying my best to do the right thing for the country." During the primaries, Trump retweeted an unflattering photo of Cruz's wife, Heidi Cruz, and gave voice to a false rumor that his father, Rafael Cruz, was involved in the assassination of former President John F. Kennedy. Trump has not apologized for dragging Cruz's family into the race, and after the convention, he continued to discuss the lines of attack. On Friday afternoon, Cruz ended his months-long standoff with Trump, issuing a statement that said he will vote for the nominee. Asked Friday night how involved he would like to be in Trump's campaign, Cruz told the Tribune he will "do whatever I can to defeat Hillary Clinton and to help preserve the Republican majority in the Senate, and also to help turn out conservatives in Texas. Those are my political priorities between now and November." 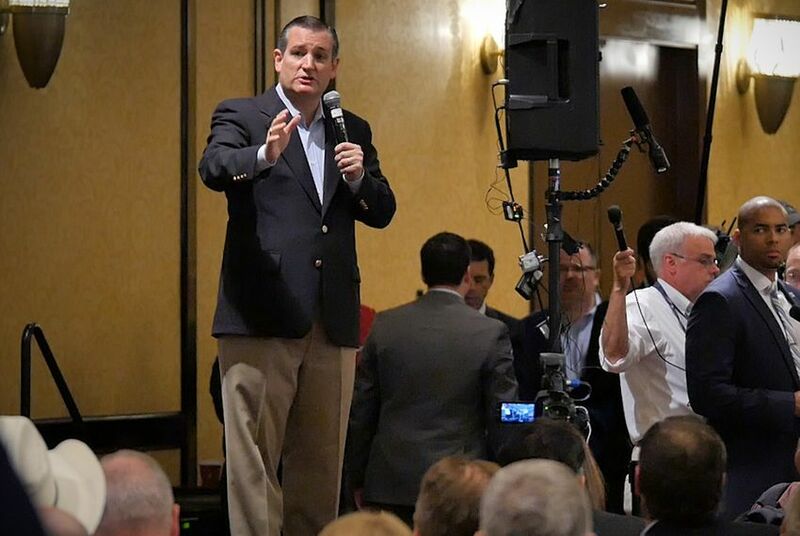 Cruz spoke with The Texas Tribune after a speech to Grassroots America We the People, a influential Tea Party group in East Texas. In his remarks, Cruz largely echoed his statement earlier today endorsing Trump, saying one his main reasons was to make good on the unity pledge. Cruz, who told delegates at the convention to “vote your conscience” in November, also reiterated that his conscience has led him to do everything he can to stop Clinton. “I don’t believe I could in good conscience look my kids in the eyes and say I sat by” and let Clinton win, Cruz said. Cruz's speech got a warm reception from the friendly crowd, which gave him standing ovations at the beginning and end. When it came to Trump, though, the audience seemed less than enthusiastic — and perhaps still processing Cruz's remarkable turnaround. Silence greeted Cruz's announcement that he will vote for Trump in November. Cruz nonetheless pressed his case for the Trump endorsement, at one point elaborating on what he called a "significant factor": Trump's decision Friday to release a second list of people he would appoint to the U.S. Supreme Court. The list included U.S. Sen. Mike Lee of Utah, a close Cruz ally and another Trump holdout. Saying Lee "would make an extraordinary Supreme Court justice," Cruz noted how the campaign promised Trump would only consider names from the list if he had to fill a vacancy on the high court. “The campaign had never said that before,” Cruz said. "That list is a very, very strong list, and I got to tell you, for me and everyone else who cares about the Constitution and the Bill of Rights, that is a big, big deal to make the promise that this is the list that you can know the people from whom” will be selected. The speech came at an annual dinner for the tea party group, which has been fully behind Cruz since his underdog Senate bid. After wrapping up his explanation of the Trump endorsement, Cruz said he trusts the group will continue to vet Republicans seeking its support.